After being cooped up indoors all winter, now is the perfect time to get outside and get busy! Trade in the gym, your work-out videos and home equipment for the great outdoors. New research has shown that spending more time outdoors may truly be the secret to a stronger, healthier body, and a calmer, happier mind. Act like a child; get outside and run around and enjoy the fresh air. Being outside makes it much easier to let go, relax, have fun and enjoy yourself. You get all the mentioned benefits along with burning off calories! Working out in the outdoors forces you to be more creative with your workouts. Being outdoors allows you to vary your routine and activity and helps cut down on boredom. 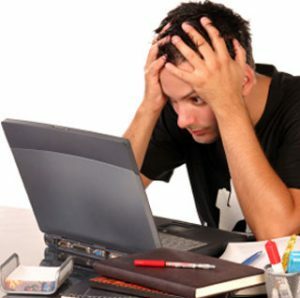 Push back from your computer, put your phone down, or get off the couch and release the stress and tension that can be caused by constantly being connected. Outdoor workouts help draw you away from the stressors and distractions of daily life. Don’t worry…you can keep your phone with you and listen to some upbeat tunes to motivate you or use one of the fitness applications to track your workout. Check out Noom a great application that will track your workout, your pace, time and give you updates as you go! This app will even use GPS and map out your workout! Get your mind, body and soul involved in your workouts. Use all of your senses when out in nature–what do you see, hear, smell and touch? Getting your mind more involved in your workouts will help destress and unplug you from your usual hectic life and will help keep you safe during your workouts. It will also help you be more aware of what is going on with your body and may even help you notice when you are using poor form with an activity. You may hear your knees complaining of the way you are performing a squat for instance, when you are in tune with your body. You may be squatting and allowing your toes to pass in front of your knees thus increasing the stress on that joint causing you pain. If you are tuned into to your body you will likley notice this early on in the exercise before too much pain or damage is caused. I love when things warm up and I can get back outside to exercise. It’s great breathing in fresh air, nice to have a change of scenery and seeing nature wake back up from its wintry slumber. I can vary my workouts, change my terrain and tax my body in ways I was not able to do during the winter. Check out Trail Link to find trails near you to walk, hike or bike. 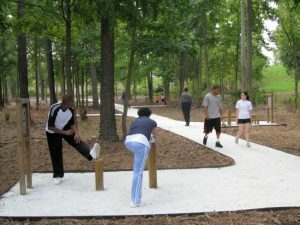 A lot of parks are starting to offer “fitness trails” which offer various stations and exercises to perform at each stop. It’s great to walk at a brisk pace, stop at each station along the way and perform the recommended exercises or modifications of those exercise. I like to perform 2 laps of the walking trail and then hit the fitness side of it and speed walk between stations and then finish up with a couple more laps. Check you local parks and see if they have fitness trails. Previous PostPrevious Having a Hard Time Staying Motivated with Diet and Exercise? Next PostNext Counting Calories for Weight Loss: Is it important?